The pins & clips plasitc badge holder strap comes with a metal snap clip and safety pin. The plastic strap can be used in conjunction with name badges or name tags. The plastic badge strap comes with an easy-open and close snap button feature for name badges or name tags. Just snap and go! It is great for general use purposes, promotions, concerts, military, schools, businesses, sporting events, meetings or tradeshows. This product comes at a low cost for those on a low budget! 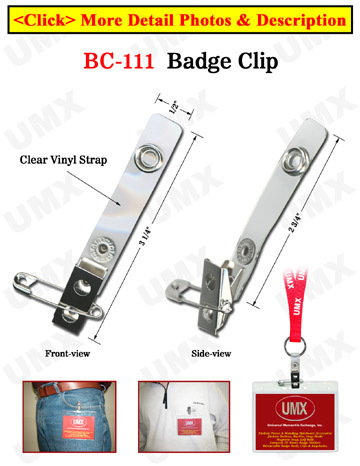 The Most Popular Low Cost Badge Holder 4(w)x3(h)"